RCA Verschlußträger für AR15 Waffen in der leichten Version 199gr. A major player on the 3Gun scene the RCA low mass BCG is compatible with all AR-15 platform systems. Made from 8620 steel and finished with H&M’s Blacknitride+ treatment this carrier is lighter than the standard M16 carrier. Weighing in at just over 8.9 ounces the RCA competition carrier makes a noticable difference in felt recoil. The carrier comes with the Nitrided and side staked stainless steel billet gas key, our Nitrided 17-4 stainless firing pin and our precision machined 9310 nitrided bolt with tool steel extractor. SPECS: 8.9oz weight. 9310 Nitrided bolt. 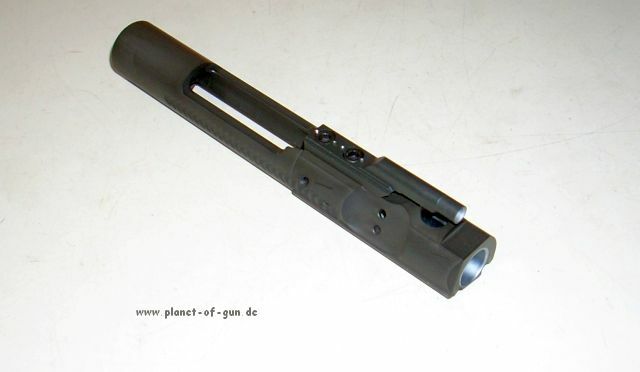 JP Verschlußträger für AR15 Waffen Low Mass 190gr. SPECS: 416 stainless steel, polished, black QPQ finish. Recommended for competition rifles only. JP Verschlußträger für AR15 Waffen Full Mass 252gr. Schmeisser Verschlußträger für AR15 Waffen 252gr. Top Qualität & ohne WBK !